Times have been busy, moodling calmly (and sometimes not so calmly). Looking back working with Moodle has proved to be interesting and an overall good experience, except for one thing: the gazillions of settings which not only require test procedures galore. They also require recommendations, because what's good for one purpose does not necessarily fit others. 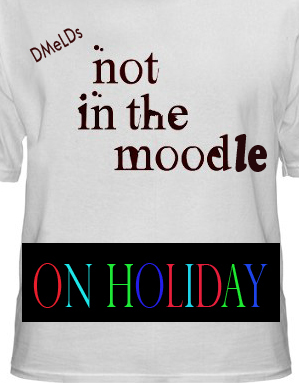 That's why they are available, and that's what makes Moodle a flexible, powerful and on occasion also tiresome (!) tool. I think so far we've only scratched the surface of what's possible to achieve in terms of blended/online learning in Moodle, and in many cases this will suffice, because there's a lot more to learning than online tools and techniques, as much as I love them. I just realised how extremely little time for reading, studying, staying in tune with what's going on around us I managed to find in the past 6 months ... on my list is - for example 'Faceted Id/entity: Managing representation in a digital world' by Danah Boyd.